The Economist looks at the advances from in medicine on the horizon and see big things: potential large increases to average and maximum life-expectancy. They survey the prospects and consider the socioeconomic ramifications. Great critical coverage from the NYTimes this morning of both Clinton & Trump. 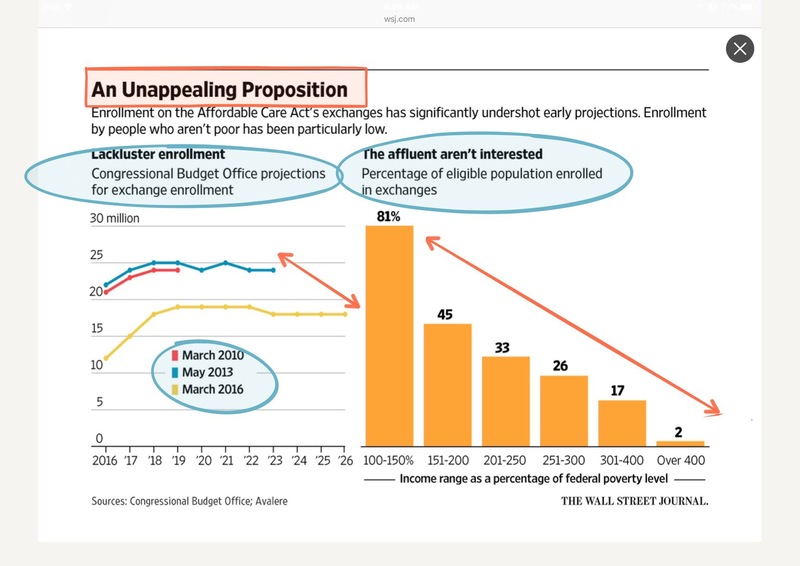 Greg Ip takes to the Wall Street Journal to discuss the much reported news of higher insurance premiums, bad P&L sheets and weakening balance sheets for insurance companies, & Aetna largely disengaging from the ACA/Obamacare entirely. Quoting Ip on the most misunderstood dynamic of the law: “It [the ACA] also did so by in effect requiring healthy customers to pay higher premiums than their actual claims would justify to subsidize sicker, older customers.” Democrats used enrollment mandates and higher premiums on the healthy as the pay-for mechanism, rather than raise taxes even higher than the bill already legislated to make the law more publicly palpable. It’s was a strategic gamble that seems to be breaking bad. Data from Ip’s article below. Jeff Spross, writing for The Week, has an interesting look at the Democratic parties support of the concept of “full employment. It’s good food for thought to consider alongside The Economist’s “Drawbridges Up,” which proposes a centrist political realignment globally.